The study of Microbiology encompasses all forms of microorganisms ranging from bacteria and their associated phage to eukaryotes (fungi, other lower eukaryotes and cell cultures) and their associated viruses. You will find the CSM divided into 3 sections: Applied and Environmental Microbiology, Infection and Immunity and Molecular Genetics and Cellular Microbiology. It is recognized that these 3 broad areas do have overlap both in research technique as well as scientific interest. It is hoped that you will all find a comfortable scientific home within one of these sections. The CSM is a non-profit organization with close to 500 members that include honorary, emeritus, ordinary, student and sustaining members. Our members include national government agencies, umbrella organizations for several societies and other Canadian biological societies. At the academic level, the CSM has University Faculty and Student representatives. Attend our Annual Conference that is held at different locations across Canada, and participate as a presenter, speaker or exhibitor. Learn from a society whose focus is on research and development. Share research developments and develop national collaborations amongst university, government and industry scientists. Benefit from a reduction of up to 33% in the registration fees of our Annual Conference. 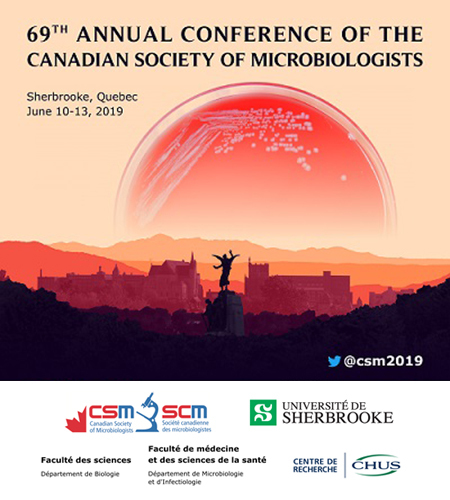 CSM speaks and acts on behalf of Canadian Microbiologists. CSM is a member of PAGSE, an organization that educates MPs and senior civil servants on the importance of research to Canadians. PAGSE also submits briefs to the House of Commons on policy issues and initiatives. Have the opportunity to subscribe to the Canadian Journal of Microbiology at a reduced rate. Members receive a savings of over $165.00 per year. Post highlights of your research or work through "Meet the Microbiologist". Search through the CSM membership directory. Post news items to the CSM website FREE of charge. Become eligible for nomination and participation in our "members only" awards.